Sweet and savory pan-seared salmon topped with sautéed shrimp in cajun butter sauce. Salmon New Orleans is an unforgettable meal. 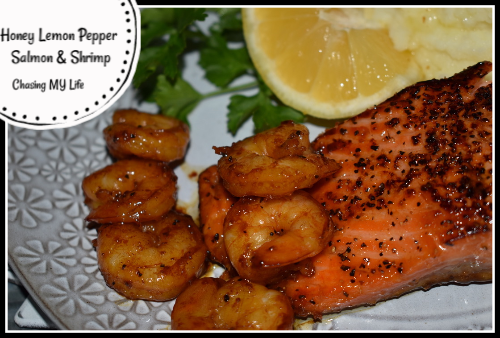 In a small bowl whisk together all Cajun OR Lemon Pepper seasoning ingredients and set aside. Season the salmon with fresh ground salt and pepper to taste. Melt 2 tablespoons butter in a large skillet over medium-high heat. Add honey and whisk to combine (mixture should be bubbly). Add salmon fillets to pan and cook for 5-6 minutes, then flip and cook another 5-6 minutes until salmon is cooked through, flaky, and browned. Transfer salmon pieces to a platter and cover to keep warm. Add remaining butter to the pan over medium-high heat. Once butter is melted, stir in cajun seasoning. Add shrimp to pan and saute’ until opaque, about 3-4 minutes. Serve salmon topped with shrimp pieces. Drizzle any extra pan sauce over the top and garnish with chopped parsley if desired.